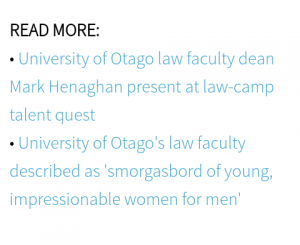 Long serving dean of the Otago Law School Professor Mark Henaghan is stepping aside from his position and will remain at the University for the remainder of the year, while his deputy Professor Jessica Parker will fill the position. Henaghan is not unknown for his recognition of men’s issues within the legal system, and his departure from the University may represent a significant loss to our advocacy within the legal framework. The lead-in to other recent articles directly below the news item (as pictured) suggests there may have been some pressure on Henaghan to depart, given the nature of the media coverage shown. Screen shot courtesy NZ Herald – links not included. I haven’t seen Henaghan standing up for any men’s issues, ever. Every time I’m seen him asked for comments, he’s always been disparaging to men and Fathers. he seems to have gone out of favour with the media luvvies since it was reported that he attended “law camps” where nefarious things apparently go on. I have also heard on the grapevine that he is moving to Auckland Uni where he can ingratiate himself with the usual 3 witches who reign over the faculty that demonises men. I have known Mark for 40 years now since I was a student at Otago. He presented at a Men’s Summit at Massey way back run by Stuart Birks. As far back as 1998 he gave a series of lecturers on Fatherhood and Family Law. He has in the past been quite supportive of men self-litigating in Family Court. It was Mark who first introduced me to Rene Smit in Dunedin. Mark’s door is always open to me when I was visiting Otago and I often sat in on his Family Law lecturers. Mark would often challenge students who came with blinkered views and that is the job of an academic. Henaghan was always a voice for sensible reasoned debate and Otago Law Faculty has never been the rabid environment of Auckland or Waikato. Bill Atkin also had a similar steadying influence on Victoria.